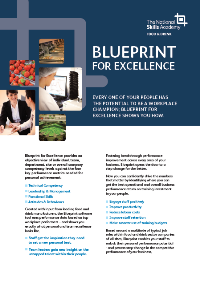 Blueprint for Excellence is a bespoke online training needs analysis tool created specifically for food and drink manufacturing and processing companies. It enables you to pinpoint the specific skill and knowledge gaps in your business that are holding back performance and productivity - so you can tightly target training investment for maximum return. 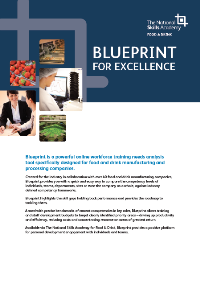 Developed by the Academy in collaboration with over 40 food and drink companies, Blueprint provides you with a quick and easy way to compare the competencies of individuals, teams, departments, sites – or even the company as a whole – against industry-defined competency frameworks. Results are automatically mapped against industry accepted standards for excellence resulting in a highly visual and totally objective depiction of areas where competency has been reached, exceeded or falls short. To complete the picture, the Blueprint assessment also includes detailed reports of the recommended training and development interventions necessary to reach industry standards. “The real power of Blueprint is the fact that it’s based on industry data and industry input so it shows what excellence looks like on a personal or team basis and how current knowledge and skills compare,” says the NSAFD's Head of Business Delivery Louise Codling. The competency frameworks on which the Blueprint tool is based are rightly regarded as a touchstone of industry performance standards and result from the extensive research carried out by the Academy with industry companies. “One Member of our Employer Services Network has used the Blueprint framework to create profiles for a number of roles. They wanted to use the documents to introduce their appraisal process into the operations department to meet an audit standard,” said Codling. “The fact that the frameworks were produced after such extensive consultation means businesses can have real confidence in Blueprint outputs. They compare all the attributes you need to do a job well - the technical competency, leadership & management, attitudes & behaviour and functional skills. You really do get a complete picture and after showing individuals what excellence looks like in a constructive way, they want to engage.